Minister for work, Des Browne, will replace immigration minister Beverley Hughes who resigned earlier on Thursday, Downing Street has announced. Ms Hughes quit after admitting she had been told about a suspected Eastern Europe visa scam. The Tories had accused the Home Office of approving some visa claims despite warnings they were backed by forged documents. Mr Browne, 52, has been MP for Kilmarnock and Loudoun since 1997. Commenting on his appointment, he said: "I am honoured to take up this job in one of the great ministries of state. "However, my first thoughts are with Beverley Hughes who has done an excellent job and helped to ensure we have a strong platform to build on. "As the home secretary has made clear, we will continue the reform agenda to ensure the system both has integrity and is seen to have integrity. "Immigration has been good for this country - but we must ensure that our reputation for being an open, tolerant and liberal nation is not undermined by fraud and malpractice." Mr Browne was already connected with senior figures in the Labour Party, having worked in the same legal practice as the late Donald Dewar, to whom he became parliamentary private secretary in his last year as Scottish Secretary. As an advocate specialising in child law, most of his early contributions in the Commons were on the Child Support Agency and the need for social security reform. Mr Browne also made use of his expertise on human rights law to support the incorporation of the European Convention on Human Rights (ECHR) into UK law. Articulate and loyal, he was always tipped to rise quickly in the party ranks. 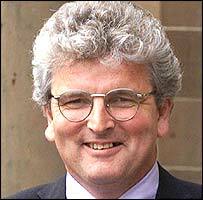 After the 2001 election, he was appointed a parliamentary secretary to the Northern Ireland Office. And in the June 2003 reshuffle he was made work and pensions minister. He will be replaced in that job by Liverpool Wavertree MP Jane Kennedy, currently a Northern Ireland Minister. She in turn hands over in Belfast to Brent North MP Barry Gardiner, her parliamentary private secretary.